Many of the guns (particularly the battery powered guns) have safeties for the little kids. These safeties can get you killed in an HvZ. As an example, the clip fed guns have "jam doors" that you can open in case a dart gets jammed. When that jam door is open, it opens a switch which turns the gun off. I've had a jam door pop open in the midst of combat more than once, until I finally removed the safeties on my gun. This can be as simple as taping the pushbuttons so they are always closed or actually rewiring your gun around the safeties. Some guns (such as the strongarm) have easy-to-find and cheap spring replacements available (do a quick search) that can significantly improve range. It's a pretty easy modification to do. The battery powered guns generally use motors with flywheels to shoot the darts. Increase the voltage and your motors will go faster and generally shoot the darts further. Increase the voltage too much and the darts start to fishtail (lose stability and hence accuracy) or your motors burn up (though replacing motors is a reasonable mod). Keep in mind that the overvoltage solutions generally involve rechargeable Lithium batteries. These are the same batteries used in laptops, but they need to be charged and discharged properly or they can catch fire or explode! So treat them properly! Voltage isn't everything. There's also a question of how much current the battery can supply. And this is where LiPo battery packs really win. LiPo batteries are reasonably cheap and can be found in many sizes, these are the batteries used in remote control planes and helicopters. A simple and slow charger can be found cheap (~$25), though a more complicated charger that can take better care of your batteries and charge much faster will get expensive fast ($50 and up). LiPo takes a little more knowledge, but it's worth it. Any "2S" LiPo battery pack will give you 7.2V and can generally dump current very quickly, which will spin your motors very fast. This is why I switched from Trustfires in all of my guns to LiPo batteries. They can be found in online hobby stores and on ebay. Most spring loaded guns have air restrictors on them that limit how quickly air can come out of the spring piston. Whether this will help you or not depends greatly on the gun. A tiny Jolt doesn't seem to be effected by it much by our tests. And a Strongarm with an improved spring with air restrictors removed will probably break if you dry-fire it (as mine did). Other guns seem to have power improvements if the air restrictor is removed. Many people chop up and change the bodies of their guns, sometimes simply for show. A very useful example of this is to cut down a RapidStrike which is, in my opinion, too large of a gun. I chopped the stock off of mine. Note that if you do this to a RapidStrike that still uses the stock C batteries then the gun will be very front heavy and harder to hold one handed. 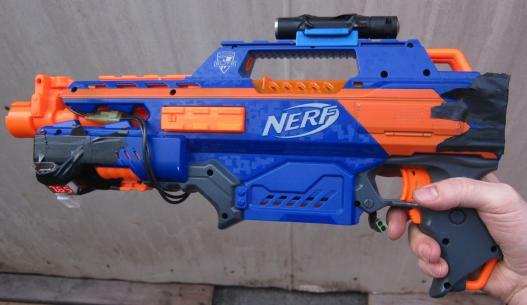 Some people have chopped both the stock and the barrel off of a RapidStrike creating the "RapidPistol", which is like a nerf submachine gun. Note that this requires replacing the battery pack which is otherwise underneath the barrel. Here's what I did to my current primary weapon shown in the photo above, it shoots about 5 darts per second, though I can still single fire. It's biggest problem is going through ammo too quickly. Switched to LiPo battery: ZIPPY Compact 2700mAh 2S 35C. It fits perfectly behind the battery cover if you detach the battery tray and drill a hole for the wires. I'm still tempted to chop the barrel off, though the current battery compartment holds my LiPo perfectly. Incidentally, if you're doing LiPo in a Stryfe, get the "Turnigy nano-tech 1000mAh 2S 20~40C AIRSOFT Pack" - it fits inside the battery compartment after you remove the separators with space still for the wires. I run all my battery wires outside the battery compartment to another connector that then runs inside the gun. Then I can just disconnect to turn off the gun and connect the gun to the charger whenever I need to charge. I don't need to open the battery compartments unless there's a problem.